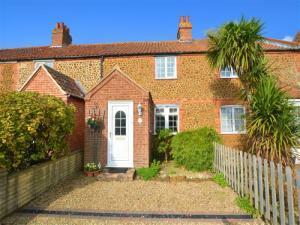 Pretoria Cottage01263 715779work01603 870304fax Self-cateringClose to Heacham's South Beach, one of two lovely beaches in this bustling village, 6 Fenway is a former fisherman's cottage that is now a cosy and comfortable holiday home. Great for families or friends, the cottage is well equipped and has a sitting room, large kitchen/dining room, a double and single bedroom and a newly refurbished bathroom. The long, well established garden and patio is a lovely place to relax after a day's exploration. There is much to do here, the local beaches are great for rock pooling, fossil hunting and when the tide is out there are vast expanses of sand for family activities and the area is renowned for great sunsets. Also close to the Royal Estate at Sandringham, the famous Norfolk Lavender farm at Hunstanton and some great eateries, Heacham offers a traditional seaside break in a beautiful part of Norfolk. Close to Heacham's South Beach, one of two lovely beaches in this bustling village, 6 Fenway is a former fisherman's cottage that is now a cosy and comfortable holiday home. Great for families or friends, the cottage is well equipped and has a sitting room, large kitchen/dining room, a double and single bedroom and a newly refurbished bathroom. The long, well established garden and patio is a lovely place to relax after a day's exploration. There is much to do here, the local beaches are great for rock pooling, fossil hunting and when the tide is out there are vast expanses of sand for family activities and the area is renowned for great sunsets. Also close to the Royal Estate at Sandringham, the famous Norfolk Lavender farm at Hunstanton and some great eateries, Heacham offers a traditional seaside break in a beautiful part of Norfolk.